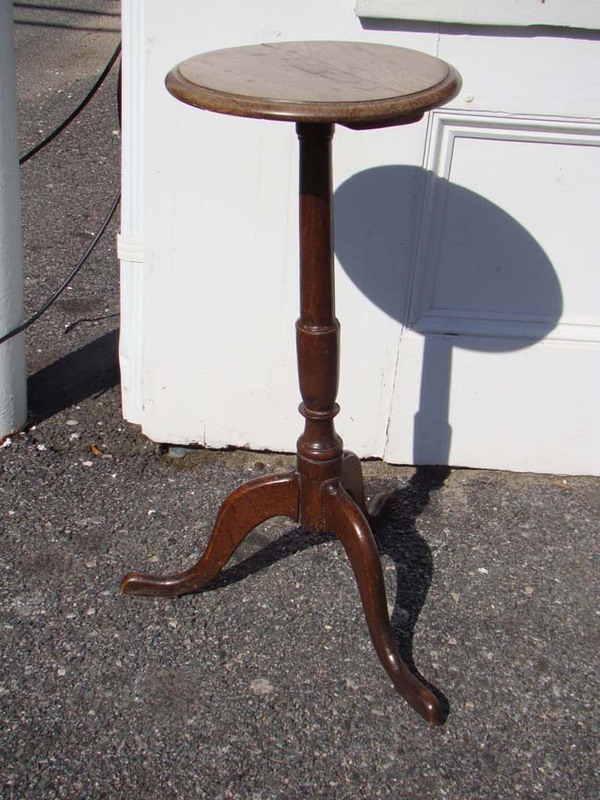 An small English oak tripod table made from the keel of the ROYAL GEORGE which sunk in 1782. 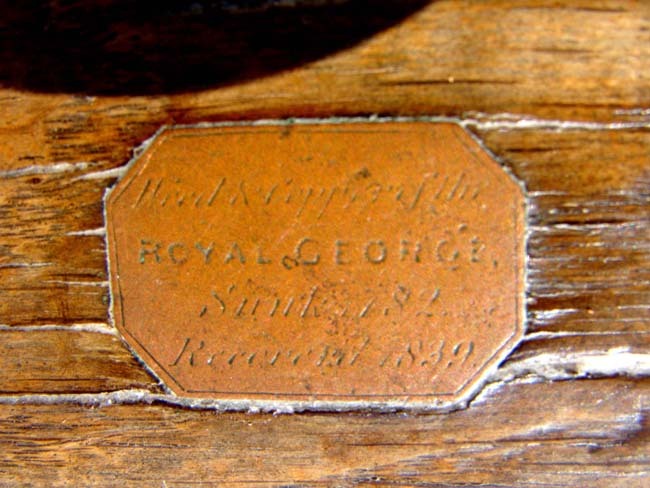 The top of this very historic relic is inlaid with a small copper plaque which is engraved as follows: "Keel and copper of the Royal George sunk 1782 recovered in 1839." The HMS Royal George was a 100 gun first-rate ship of the line of the Royal Navy launched in 1756. It was the largest warship in the world at the time of the launching. She saw service during the "Seven Years' War and was Admiral Sir Edward Hawke's flagship at the Battle of Quiberon Bay in November 1759 where she sank the French ship Superbe. Hawke's previous flagship was the HMS Ramillies. The ship later took part in the Battle of Cape St. Vincent in January 1780. In 1758 the ship became the flagship of Admiral Lord George Anson. The ship returned to Britain in early 1780 and had her hull 'coppered. 'In late 1781 the ship became the flagship of Rear Admiral Richard Kempenfelt. on August 29, 1782, the ship was anchored in Spithead to take on supplies. There were about 1,200 crew members on board as well as 300 women and 60 children who were visiting the ship at the time. While work was being done on her hull the guns on her starboard side were moved to midships to allow her to keel over to port. At the same time a delivery of rum was taking place on the port side which made the ship unstable and water came in through the portside gun ports. She heeled over, filled with water and sank very quickly. About 900 lives were lost including Rear Admiral Kempenfelt and all 300 women. Only one child of the 60 on board survived. The remains of the Royal George remained untouched until 1834 when 30 guns were recovered along with some wood and copper from the ship. In 1840 the broken wreckage was destroyed by the Royal Engineers in a huge controlled explosion. This table is a rare survivor of a very tragis event in British maritime history. The table stands 26" high and the top has a 12" diameter.